Subject: the position of the Serbian Orthodox Church regarding the methodology of overcoming of schisms in Ukraine and elsewhere. During the annual meeting of the Holy Synod of the Hierarchy of our Church, which took place from April 29 to May 10 of the present year, discussed in the synod, among other matters, was the problem of schisms in the Orthodox East, namely, in Ukraine, in the Former Yugoslav Republic of Macedonia and elsewhere, as well as the problem of the “sect” in Montenegro, which is led by a certain Miraš Dedeić, a former clergyman of Your Most Holy Church, who was defrocked by Your decision. From the brotherly discussion in the Synod, it became apparent that the heresy of ethnophyletism constitutes one of the principal malaises of contemporary Orthodoxy. In this connection, it is very important that the Holy and Great Synod that took place in Crete, among its other decrees, validated the ecumenical significance of the Council in Constantinople (1872), which branded the ethnophylite heresy as also a “snake venom” dissolving the body of the Church. Firstly, this took place in the Soviet Union through the creation of “reforms” and the “Living Church”, as well as through the attempt to replace the canonical Church having the holy patriarch Tikhon at its head, with the “Renovated Church” or the “Living Church,” which was the only legitimate one from the perspective of the Soviet authorities, but moreover was reformed, but rather had been deformed, according to the standards of liberal Protestantism. Within the territories of the Kievan Rus, Ukraine was established at the same time as one of the federated states of the Soviet Union, a “Ukrainian nation” was especially proclaimed, and the linguistic peculiarities of the Western regions of Russia at that time were combined into one whole and this linguistic amalgamation received the official status of a special Ukrainian language. Ukraine was not an exception: in the same manner also, Belarus was “elevated” to be a constituent part of the federation, again with a particular “national identity” and language. Indeed, also furthermore, the former “Russian Turkestan” was divided, according to national divisions, into Kazakhstan, Uzbekistan, Tajikistan, and other “-stan’s.” The Ukrainian separatist mindset has, nevertheless, even deeper historical roots, paramount of which is the Unia of Brest-Litovsk at the end of the 16th century, which was spread by force during later years. In the soil of this separatist path, the flowers of evil blossomed under the form of Ukrainian Nazism (“banderovtsi”) and of the holocaust of the Jewish community (Babi Yar and other places of death). Alongside the separatist tendency, ecclesiastical ethnophylitism and the ecclesiastical separatist movement are at the same time emphasized, of which the “Church of the Self-Ordained” (αὐτοχειροτονούμενοι) constitutes the pathological apex, which was wholeheartedly supported by the Nazis of Ukraine. We certainly do not refer to all these things for proof of our historical knowledge or, much less, to insinuate imperfect historical knowledge among certain others, but for a reliable highlighting of the background for the spiritual origins both of the ecclesiastical schisms as well as the fratricidal conflicts in contemporary Ukraine. The very name of the state and nation, and then even of the Church, makes this evident. As matter of fact, “Ukraine” means frontier or border region, a part of a greater whole, namely, a part of the Kievan Rus, which before 1030, Prince Vladimir, equal-to-the-apostles, baptized. Other border regions were also entitled “Ukraines”. A similar thing also took place in the Southern Slavic lands. Communist Yugoslavia was organized in a manner consistent with the Soviet model and example: the state was converted into a federation, subdivided into a supposed “republic” (in 1974, it was indeed transformed into a confederation, i.e., it was broken up into coexisting states, and finally, in 1991, was divided, both externally and internally, into “separately existing” states and provinces). Concurrently, newly-minted nationalities (“Montenegrins,” “Macedonians” namely the nascent “Northern Macedonians,” “Muslims” who were renamed into “Bosnians”) and newly-created languages (Montenegrin, Macedonian, Bosnian) were proclaimed. The process of further development of “nations” and “languages” was interrupted because of the intervening death of the state. As formerly in the Soviet Union, this development was accompanied by the creation of new churches, to speak more accurately, of schisms, which served the Communist party and its ideology. Among other things, Tito’s regime thus declared the southern ecclesiastical provinces, which were assigned by the Patriarchate of Constantinople in the Tomos of 1922 to the Patriarchate of Serbia, to be a “Macedonian Orthodox Church.” It is unique in the history of the Church, that a communist party is also the founder [of a Church], as is also stated in the relevant decree, published in the meantime. A much worse and more serious case is tat of the so-called Church of Montenegro. 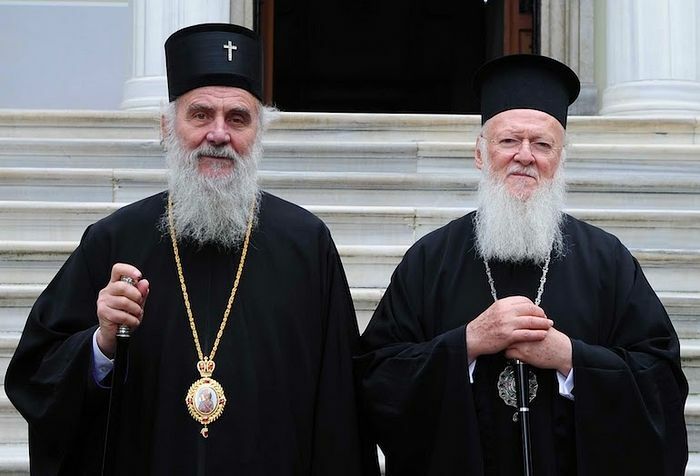 While three canonically-ordained bishops of the Church of Serbia created the schism of Skopje, our Church up to the present time did not defrock either them or their successors, having the principle of economy, awaiting eagerly their repentance and not making their desirable reintegration difficult in the future. In contrast to them, worth no regard, in this connection a non-governmental organization in the form of a church, the self-labeled Montenegrin Church was founded by a defrocked clergyman of the Patriarchate of Constantinople and registered in a public police station. Accordingly, at no point of his confused life, did this shifty and tragic person serve as an Orthodox bishop. False clergymen make up his “clergy,” either defrocked clergy or ones he himself had “ordained,” and belonging to his “faithful” are political leaders and “sympathizers,” that for the most part are unbaptized, some even atheists, including some “Muslims,” in all likelihood [including] such Muslims, because also the “Church” is supported by them. The Eastern Roman Empire was a model state, and constituted the spiritual and vital land of many ancient Christian Churches and the protector of Christian morality and civilization, which those who found themselves outside of the boundaries of the Empire also adopted. This Orthodox Christian Empire endowed the Church and the world, with among other things, the New Rome, as well as the bishop of the New Rome, whose authority and influence in the Eastern provinces of the Roman Empire was equal to the authority and influence of the bishop of the Old Rome in the West and whose Church even today enjoys the position and the rank of the Church of the first throne among the local Orthodox Churches. Furthermore, from even after the fall of the Roman Empire (1453) until the assassination of the tsar and his family in Russia (1918), the “Byzantine commonwealth” preserved the idea of the Christian state and cultivated the tradition of “symphony” of Church and State. In other words, from the years of the holy emperor Constantine the Great until the years of the holy martyred tsar, Nicholas Romanoff, the state, state authority and the people serve ideally and inherently, though in practice as far as possible the Christian faith and Church. From that time onward, the newly-created secularized states and nations attempt with much effort to use the Church to serve their ideology and authority, as a rule non-Christian, but often being directly contrary to the Gospel. Therefore, the Church generally and the first throne, the Great Church of Christ, specifically finds herself, after the end of the “Constantinian age” in the history of the Church, in an altogether new position, in a fundamentally changed world and with a new, singular responsibility. To speak in an open manner and sincerely, it is not appropriate that she permit for herself the practice of those things that she did not even practice during the height of her fame and might, namely, during the “golden age” of Romiosini. However, it is likewise not appropriate for the other sister Churches to permit for themselves an ungrateful or, God forbid, unseemly and unprincipled attitude against the Church of the first throne, but also even a Mother Church for the newer among them. The present “golden rule” particularly applies to the subject of the conferment of autocephaly to any Church. The unhealthy ethnophylitism and the secular state-centric mindset of our days lays the foundations for their claims on the relationship of the Orthodox Church to baptized peoples and to the, so far as it is historically possible, Christianized societies; nevertheless, they achieve one thing only threatening the catholic and ecumenical character of the Church of God, in this way perhaps also her primal mission to all nations. The states, nations and “nations,” in which autocephaly is sought, but in practice state-sponsored “political schisms” take effect, which also openly excuse their pernicious activity for the invocation of the state and national agenda, are creations of the Communists, which today for the most part have atheists as leaders, such as the unbaptized and atheist head of Montenegro or the “all-comprehensive believer” such as the president of Ukraine, who is seen in the canonical Church, among the schismatics, and among the Uniates. They do not seek an autocephalous Church because, allegedly, they are its faithful members, but they use it as suitable, but rather unsuitably , for the purpose of strengthening their worldly and essentially atheistic ideology, power and vulgar interests. In the last analysis, it is a question of an abuse of the Church and of the Faith. Can it be that the condescension of the Church is permitted for such an abuse? For she who is intended to transfigure and save the fallen world, is it permitted for her to conform to and please it? We address these questions especially to the Ecumenical Patriarchate, to our Mother Church, which is called, in the capacity of first throne of the Church, so that, cathartically and sacrificially, she might serve for the unity of the Church. Under no circumstances, influences or pressures whatsoever is it permitted for her to proceed to any hasty action capable of affecting harm to pan-orthodox unity, but especially also of protracting the life of schisms, which, otherwise, it is desired that she might remedy and overcome. This general principle quite especially applies concerning the now tragic schisms, namely, concerning such ones in Ukraine. A one-sided act of exonerating and restoring schismatics to the rank of bishops, but quite especially of the archschismatic, of Filaret Denysenko the “patriarch” of Kiev, and of restoration of liturgical and canonical communion with the schismatic communities, without their repentance and return to unity with the Russian Orthodox Church from which they broke away, against the will of the Patriarchate of Moscow and without coordinating with it, would be, according to our belief, very unsafe or even catastrophic, but even potentially fatal for the unity of holy Orthodoxy. Such an act would signify at the same time an unbrotherly attitude towards the martyred Church in the Russian lands, when this by no means is expected from the martyred Great Church of Christ. The intervention of Your predecessor (who came to a blessed end), the ecumenical patriarch Gregory VII, in the affairs of the Russian Church approximately a century ago, as well as his attitude towards the holy patriarch Tikhon, the confessor of the faith, on the one hand, and towards the schism of the “renovationists” on the other, should not be used as an example for emulation. Nor may the fact be overlooked that the Holy and Great Council in Crete confirmed in its ecclesiological encyclical the existence of fourteen autocephalous Orthodox Churches in their present canonical boundaries. The question arises: how is the change of this number of autocephalous churches possible, absent a new Council? Next, by the statement in question of the Council in Crete, it is affirmed implicitly that the autonomous Church of Ukraine is found under the jurisdiction of the Patriarchate of Moscow and that it wholly belongs to it organically. In this case it is unfathomable that the Russian Orthodox Church does not have jurisdiction for the canonical establishment of the Church in Ukraine, but that the “Mother Church,” namely, the Church of Constantinople, does have jurisdiction. Being viewed under the prism of history, the Church of Constantinople is equally Mother Church of both Kiev and Moscow, and of Peć (with Belgrade and Karlovci) and Tyrnavos (Sardica, Sredets, Sofia), and others… If then she has the right of intervening in one autocephalous Church, then, as a consequence, she possesses the right of intervention in every single autocephalous Church. In the meantime, the honor and dignity of ecclesiastical motherhood does not provide the Mother Church with the right of setting no value on or, all the moreso, of questioning autocephalies and jurisdictions that were historically formed. In the same manner, established jurisdictional status does not give the Churches the right to belittle and disdain the Mother Church or to pretend that they forgot that a Church is the one who spiritually gave birth to them, or to “order” a Mother for themselves (like the schism of the Skopjans). An eloquent example of these things being the case is precisely our Church, the Serbian Orthodox Church. Our Mother Church is the Church of Constantinople. Previously it came under the jurisdiction of the Archbishop of Ochrid, but today, as a consequence of many historical events and of the Tomos provided in Constantinople in 1922, the Archbishop of Ochrid comes under the jurisdiction of the Serbian Orthodox Church. In the case of these things, the following results: concerning the future status of the Archbishop of Ochrid, it is not possible for the Ecumenical Throne to decide de jure, absent the Church of Serbia, for the simplest reason that the Archbishop of Ochrid is found under the canonical jurisdiction of the Church of Serbia, as it is also recorded in the Tomos of 1922. Since then, all the Orthodox Churches without exception recognize this jurisdiction. The same thing applies also for Ukraine, but to speak more accurately, for Kievan Rus, a Church that without a doubt and undeniably is subject to the jurisdiction of the Patriarchate of Moscow, and which has the status of an autonomous Church. Your Most Holy Church, All-Holiness, puts forward from time to time the claim that the Metropolis of Kiev belongs in reality to her and that it has belonged to her continually. Nevertheless, we wonder with all brotherly love and honor: how the fact can be explained that Moscow for so long a time, for three centuries and more, exercised and now exercises jurisdiction over Kiev without any protest whatsoever, from the Great Church of Christ being involved? In addition, the available historical sources do not confirm the allegation concerning the lack of the de facto jurisdiction of Moscow for Kiev. Besides, in the sacred canonical tradition and practice of the Church, the criterion of antiquity existed, of “ancient customs” of relations which had been accepted by all, as You, because of being a distinguished canonist, know better than our own mediocrity. Within this context we are obliged to point out, that, after decades of theological labor, the process for acquiring and declaring new autocephalies was also agreed in a pan-orthodox manner. The relevant definitive official text was published in the pages of the periodical Synodika publshed by the Chambésy Centre of the Ecumenical Patriarchate. The manner of signing the Tomos for autocephaly was the only point not agreed upon (with the addition, “it is decided/it is decided together” [ἀποφαίνεται/συναποφαίνεται] or without it). The whole process is thus clear: the Church having jurisdiction takes the initiative of granting autocephaly to any of its own eparchies, the initiative is forwarded to the first throne Church, from whom it is communicated to all the local Churches, consultations follow and, in terms of results, either we have general agreement concerning a new autocephalous Church or a new autocephalous Church does not exist. This is the generally acceptable and accepted position of the local Orthodox Churches and not the stance of one of the hierarchs of Your Most Holy Church, that the Ecumenical Throne alone, absent the rest, without equals (sine paribus), grants or removes autocephaly, acting indeed in this way for 1,350 consecutive years (!). All-Holiness, in no way does the desire and intent to offend or aggrieve You at all come into our mind, not even indeed briefly, however, we are obligated to remind You both of Your promise, which was given in Chambésy Geneva in the presence of the Primates of the Orthodox Churches in the presence, consequently, also of our own mediocrity that you would not intervene into the affairs of the Church of Ukraine. Finally, some other questions are also raised, and indeed key questions. How is the recognition of archpriesthood possible at all for a priest who was defrocked by Your Most Holy Church, but then “who has been ordained” as a bishop by schismatic bishops who are deprived of grace, likewise in the meantime who were defrocked by their own Churches? Here, as you can recognize, we have in mind Dedeić, “primate” of the rival assembly or “sect,” which deprived of divine grace, calls herself Church of Montenegro and, like her elder “sister” in Skopje, believes and trumpets, that, after the granting of autocephaly to the Ukrainian schismatics, she will also herself receive recognition and autocephaly. Still incomparably worse is the case of Filaret Denysenko, the self-proclaimed patriarch of Kiev, who is not only defrocked, but also excommunicated and, in addition, anathematized. Not one Church, beginning with Your Most Holy Church, has questioned these facts nor is it possible to do this. But in order that the disorder and chaos might be magnified still more, alone in the world, Filaret recognizes Dedeić as “metropolitan of Montenegro,” concelebrates with him, visited him, and recently, on July 28, during the celebrations organized by Filaret for the 1030th anniversary of the baptism of the Kievan Rus, the legate of Dedeić, “archimandrite” Boris Bojović, likewise a false clergyman, “concelebrated” in Kiev. According to the popular saying, “The sack found its patch” (Serbian), “The pot found its lid” (Greek and Serbian), “Philip found Nathanael” (in the midst of theologians). Taking into consideration all the things mentioned above, the conclusion is unavoidable that Denysenko and Dedeić indispensably wished to be restored as a “package,” both together, which from a nomocanonical point of view would be a grotesque absurdity. For which reason, we have been persuaded, that you personally and the Holy and Sacred Synod around you wish to remain on the ramparts of orthodox ecclesiology and age-old canonical order. We wrote all these things to You, All-Holiness, in optima fide, in the name of the Holy Synod of the Hierarchy of the Serbian Orthodox Church and in our own name personally, because we are concerned most deeply for the unity of the Orthodox Catholic Church after the statements of one of the hierarchs of Your Most Holy Church, that the delivery of Your Tomos concerning autocephaly to the schismatic “Churches” in Ukraine is immenent, totally contrary to the will indeed of the canonical Ukrainian Orthodox Church and the Russian Orthodox Church, in the name of past ecclesiastical maternity as an innovational canonical adaptation. At the same time, it is reported that a similar delivery is planned also for the schismatic “Macedonian Orthodox Church,” which uncanonically and illegally appropriated the eparchies of the ancient Archdiocese of Ochrid, which were integrated, after her dissolution, into the body of Your Most Holy Church, and were given to our Church by the Tomos of 1922. If, God forbid, such a thing were to take place, this would be a realization of the wise Greek proverb according to which, “when one evil occurs a myriad follows,” as well as an affirmation of the enduring timelessness of our Savior’s teaching, that it is when the unclean spirit has been expelled “he brings with him seven other spirits, more evil than himself,” together with them he enters again into the man and “dwells there” if he might find his former “house” “empty, swept and put in order” (Matt. 12, 43-45; cf. Luke 11, 24-26). Certainly, none of us wishes the consequences set forth, since “the last state of that man becomes worse than the first” (Matt. 12, 45; cf. Luke 11, 26). Namely, we renounce the dreadful prospect that after one evil or perhaps one unclean spirit, the evil and the spirit of already existing schisms, other evils and other evil demons follow, namely, a new schism, deeper and harder to cure, or even schisms. For which reason, again and again we persist in asking and entreat earnestly Your holiness and love: before you even cut once, measure three times! Venerating the Cross and crucifixion of Your Most Holy first throne Church, with all our souls let us beseech our Crucified Resurrected Lord, of the Head and Bride of the Church, of the Author and Accomplisher of our faith, of the Overseer of our souls, of the First and of the Last, of the Beginning and of the End of all things, of the Alpha and the Omega, to grant strength to our Mother Church in not succumbing to pressures and [to grant] wisdom from above in keeping her strong and forever faithful to herself, to her mission and service. The aim of this world’s and this age’s powers that are borne by the Antichrist is the annihilation of the being and the work of the One, Holy, Catholic, and Apostolic Church of Christ, while the aim of us all, who shepherd the Church and unworthily concelebrate with her only Archpriest and Chief Shepherd, Christ our Lord, is service to her theanthropic and pneumatological mission, and the safe-keeping of her unity, which has been entrusted to and appointed for us. The Orthodox Church is today the only institution, which saves from death and guards on all sides also the unity of all the Orthodox peoples, which was sealed by the blood of the martyrs and new martyrs. Being crucified with Christ, she rises each time and at the same time causes the world to rise together. She is the hope and the future of humankind.